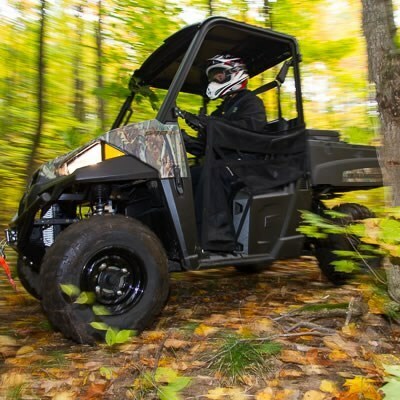 My first day with the all-new Polaris ACE ATV and I quickly realize I have zero reason to doubt its ability, despite its unique appearance. So far today I’ve been through water, mud and an assortment of bumps, ruts and rocks. But the trail ahead - whoa; narrow, steep, and strewn with rocks. I think the industry term for this kind of rubble is “Baby heads” but these must’ve come from a race of giant babies with big square heads. I ease the shifter into low gear and lunge forward, fully expecting an immediate loss of traction or the grinding of rocks on the undercarriage. But there's none of that, with a steady throttle the ACE climbs rock over rock while I do the rag dog inside the roll cage. This is a win or lose kind of scenario, a breath-taker, a guaranteed adrenaline injection. Then BAM! 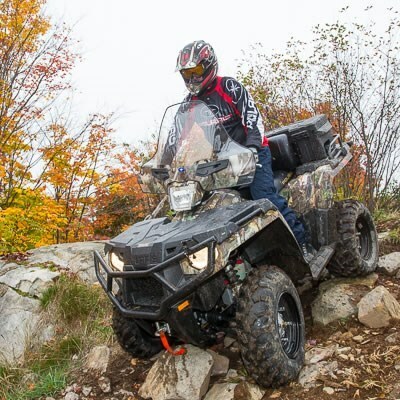 we're passed the hardest part of the trail and are on top of the world in Algoma Country’s ATV trails in Elliot Lake. The view of the town and the North Channel of Lake Huron in the distance tucked away in a fall-coloured blanket is…impressive! 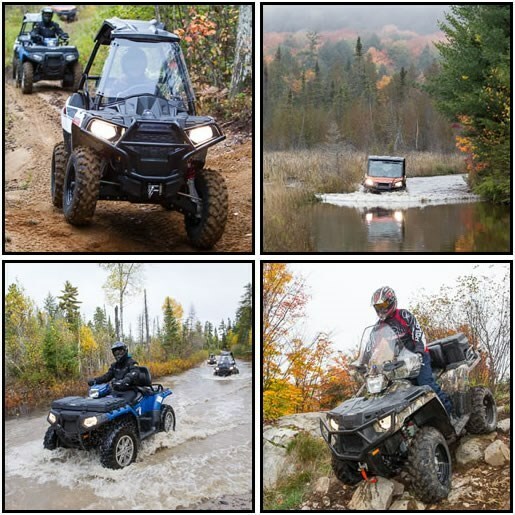 I could go on telling you about the awesome ATV trails around Elliot Lake that we have been riding all morning, the views from hilltops, the waterfalls, the fall colours but this trip is more than just a great trail ride. This time we’re helping shoot an incredible TV show with some friends from the USA. 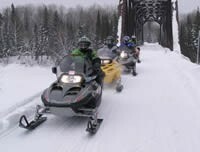 Destination Polaris airs on the Fox Sports Network bringing amazing stories of ATVing around the world to its dedicated fans, and we were lucky enough to follow along with them while they gathered footage for their show about riding in Algoma Country and Explorers’ Edge. On our first day of riding, one by one people arrive at the breakfast table, the show hostess, the camera men, the local Polaris rep and a strong showing from the local dealers – most of them don’t know each other, travelling at night to all meet here in the morning based on a string of e-mails planning out the ride. The location, Laurentian Lodge, is one of Algoma's premier accommodations with lake views, cozy cottages and fabulous food. So what’s a bunch of dirty ATVers doing at a location worthy of a postcard or a wedding album? 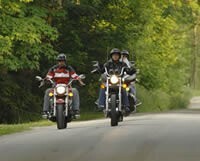 Well, the trail starts at the lodge’s parking lot and the riding possibilities from here are endless; reason enough. Its not long before we're firing up the herd of Polaris all terrain toys waiting for us outside after the hearty breakfast. The Ranger XP two-seater for the film crew, a couple of Polaris ACE’s for the stars of the show and a selection of Polaris ATV’s as the support crew. My ride for the day, Sportsman Touring 570 EFI, is a fish tailing delight in two wheel drive and a mountain goat when you pop it into 4x4. The area is crawling with old logging roads and snowmobile trails. With no print map of these trails available my advice is to hire a local guide; it’ll make your day in more ways than one. 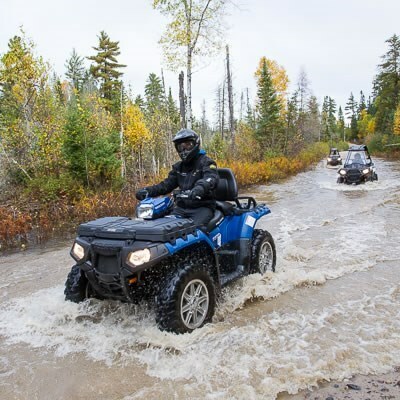 Luckily for us we were well equipped with local knowledge and enjoyed a fabulous day in the boreal forest, with awesome trails, good company, fall colours and hints of the area’s mining and settlement history. 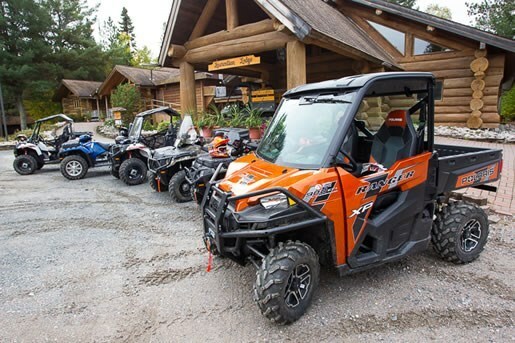 As unforgettable as our experience at Laurentian Lodge was, the true ATV jewel of the area is the 300 km trail network around Elliot Lake. Mapped and marked, these trails loop deep into the wilderness where challenges for all riding skills await. Wherever you choose to venture, the town is never more than fifty kilometers away . 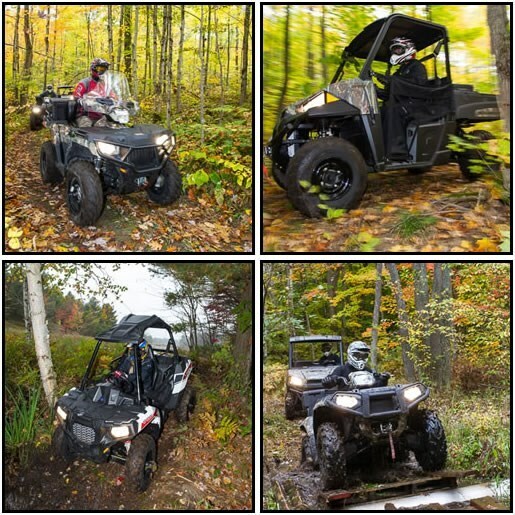 Lodging, food, and gas are all easily accessible from your ATV. Onto day two. We’re at the top of the hill, with the spectacular view below us, and with an amazing few hours of riding already under our belts. Unfortunately all good thing must come to an end and for us this hill top is the end of our Algoma adventure. “Where to next?” the TV crew asks and our answer is “Muskoka"
The Americans are finally starting to catch on to just how huge Ontario really is...lol. Our final destination that day was Bayview Wildwood Resort. Built on the foundations of an old saw mill, they’ve been providing the quintessential Canadian vacation experience for over a century. Located on the shores of Sparrow Lake in the southern reaches of Explorers’ Edge, offering a variety of kinds of accommodation, a ton of activities and fabulous food, the group would have been pretty comfortable kicking back and relaxing, but that’s not why we’re here. 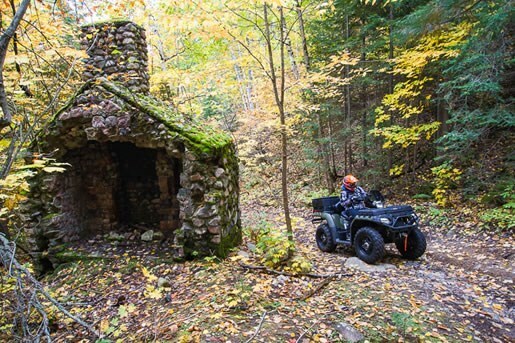 To access their local trails, you can bring your own machine or rent one here. No experience? No problem! They provide lessons too. 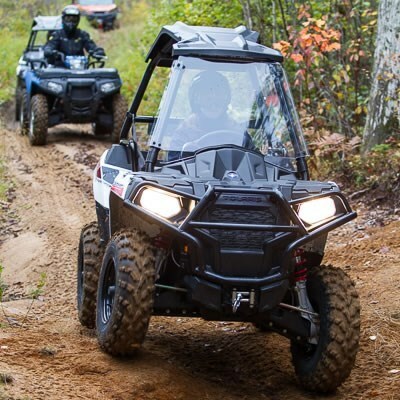 The numbers of riders swelled, adding two more Ranger 570 side by sides to the mix. 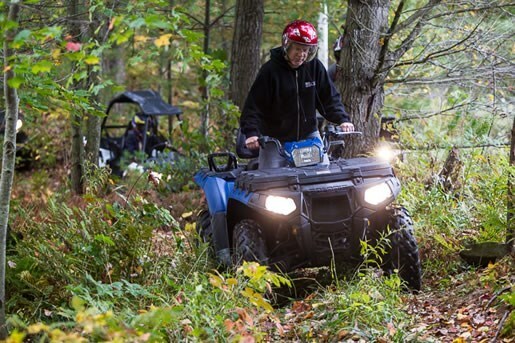 Eddy Van der Meulen, the resort’s resident ATV expert, instructor, proprietor of Redline Outdoors and our guide for the day wonders if the wide-footed Ranger XP will fit on these home-grown trails. “Never had one of these in there.” he says. “Let’s put the camera guys in and they can be at the front of the group but just behind me.” The keys to the Ranger get tossed in my direction and I accepted the challenge of fitting the large boxy Ranger into the tight Muskoka forest. This is Canadian Shield country which means the numerous trees get equal representation to the number of rocks. Add a bit of mud and its ATV heaven. A steady throttle hand and good focus is favoured over speed as we crawl over rocks and squeeze between trees. Fern lined trails, silky calm backcountry lakes and giant beaver dams provide visual stimulation. Did I mention the mud? Yah, got to test the front mounted winch on the Ranger; it works good. 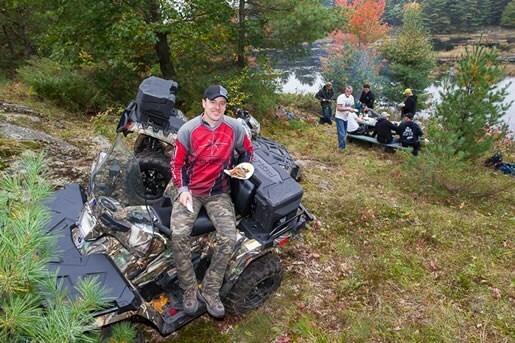 The shore lunch, a common experience for fishermen, but for a group of ATV riders, a totally unexpected treat. Set on the shores of a backcountry lake, cooked over an open fire, you have a choice of fresh local pickerel or trout with a side of potatoes, followed by a homemade cookie chaser. All set up and prepared by the skillful hands of the Bayview Wildwood Resort head chef. The food, the setting, the experience, the whole day, amazing! So I’m sure you’re all thinking, yah,yah this is all good but did it fit? 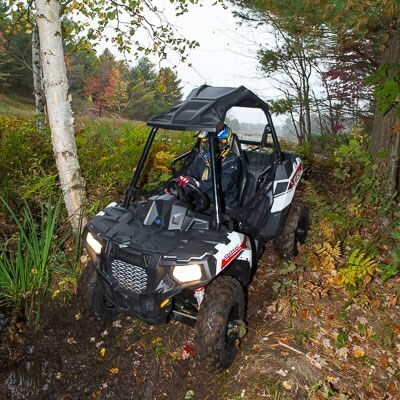 Did the Polaris Ranger XP fit the trail? The answer is yes. But judging by the scuff marks on the roll cage, just barely. Hey, the tight quarters made driving it that much more fun. 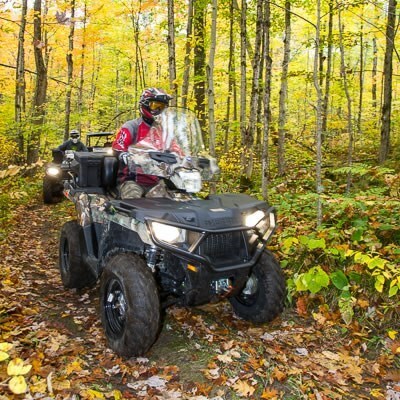 If you’re considering an ATV trip to Ontario, check out this website or go to the Algoma Country ATV page, or book a stay with Bayview Wildwood and ask for Redline Outdoors to guide you and supply you with ATVs – you won’t regret it. 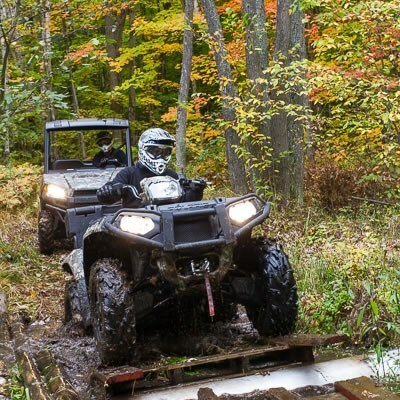 Keep an eye on Fox Sports TV and Destination Polaris website for the Ontario episode to air in Spring 2015. You just might see me there!